In terms of popularity since 2003 until the present, the Sizzling Hot slot game recorded a rapid increase with every new release or version. Let's break down this 15 year period and take a closer looks at things. Starting with the first release in 2003, Novomatic appealed to slot machine fans of the fruit machine genre. The 2000 - 2005 was a period of glory, especially for land-based slot machines. In various parts of Europe basically, every bar or nightclub had slot machine games that were very frequented. Most trending slot machines were the fruity slots or the so-called fruit machines. Unlike the first slot machine, the Liberty Bell created by Charles Fey, these slots ran on the 5 reels and 3 rows system. Taking over the land-based slots in favor of online gaming wasn't easy. The period between 2003 and 2008 was pretty rough for Sizzling Hot. As the Google graph shows it had very little popularity over this 5 years period. With the release of Sizzling Hot Deluxe on 13 November 2007 that changed. The deluxe version had improved visuals and was overall better than the original. The game then gradually started gaining popularity, and a significant increase in search volume started about April 2009. This was also the point when online slots started gaining priority over the local ones. Between 2008 and 2012 Sizzling Hot was played online in European countries like Albania, Slovakia, Romania, Germany, Latvia, Macedonia, United Kingdom, Hungary, Poland, Sweden, Finland and others. The period between 2012 and 2014 was when Sizzling Hot Deluxe was the most popular as the graph shows. 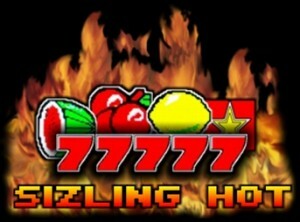 With the release of new branches of the Sizzling Hot slot in 2013, Quattro, Extra Gold, Gems, Gold, Hot Pro 5 and Sizzling6 Novomatic basically took over the fruit slots genre.